Using examples from tech-startups in the social sector, the speaker will talk about how social entrepreneurs can envision the impact that their startups will cause. Based on this how to plan the strategic initiatives and back track it to the action plan timeline and developing a matrix to measure the social impact that their startup will cause will be touched upon. 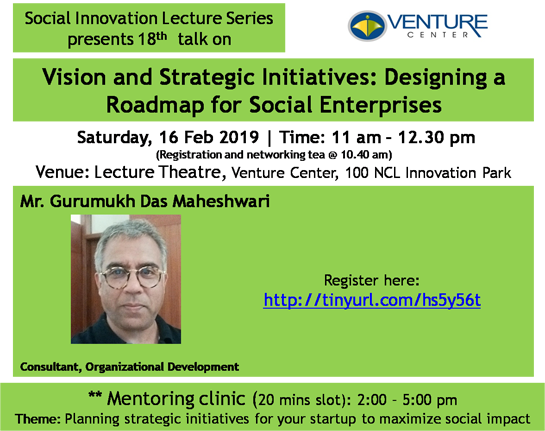 The broad focus of the talk would be to develop the overall roadmap for the social enterprise, where the speaker will be sharing his thoughts about how to conceptualise the vision and align organization endeavours towards it. Gurumukh is a freelance consultant in Organizatioal development particularly mentoring startups on leadership development and change & transformation. He has successfully led change & transformation initiatives in global context, strategically built and nurtured humane but performance driven organisations and worked in metrics and cross-cultural environment to build performance and development culture. He is a staunch believer and facilitator for partnering, co-creating, collaborating and empowering work places. He has been advising organizations and leaders on people and leadership dimensions. He also focusses on aligning individuals and teams to organization visions and high-level strategic initiatives, integrating and leading people agenda of organizations. His corporate experience spans several sectors, more than half of which have been at the Senior Leadership levels, worked across a wide spectrum of enterprises, ranging from Global/ MNCs to family led businesses with diverse industry exposure that includes Manufacturing, IT, Financial Captive etc. He has set up three organisations from scratch to successful entities.